Fire Siege Fortress is a standart 5 reel video slot, with 10576 paylines and powered by NetEnt software provider. You will enter the medieval world of shinning knights, castles and fire-breathing dragons. Video slot have signature Net Entertainment high quality graphics. Low value symbols are medieval themed playing cards – from A’s to 10’s. Medium value symbols are hammers, axes and swords, whereas high value symbols are shinning knight and fire-breathing dragon. Wild and Scatter symbols also are available. Before investing real money players can try Fire Siege Fortress Slot for free, or visit any NetEnt Casino such as: King Billy Casino, Big City Slots, PlaySunny Casino and others to play with real money and win. Before you start your medieval adventure, your bets need to be placed. Coin denominations can be adjusted using “Coin Value” button. Number of coins per line can be set by “Level +/-“. Highest bet value can be placed by “Max Bet”. “Autoplay” button is for setting up number of times the reels will turn automatically and “Spin” button is represented as two arrows. There are 3 different Wild features, which are activated when Wild symbol lands on the bottom position of reels 2, 3 and 4. Positions are always highlighted. – Archer Attack feature – 2nd Reel feature: 1 – 3 Wild symbols will be randomly added to the reels. – Dragon’s Breath feature – 3rd Reel feature: expanding wild symbol appears, covering whole 3rd reel with Wilds. 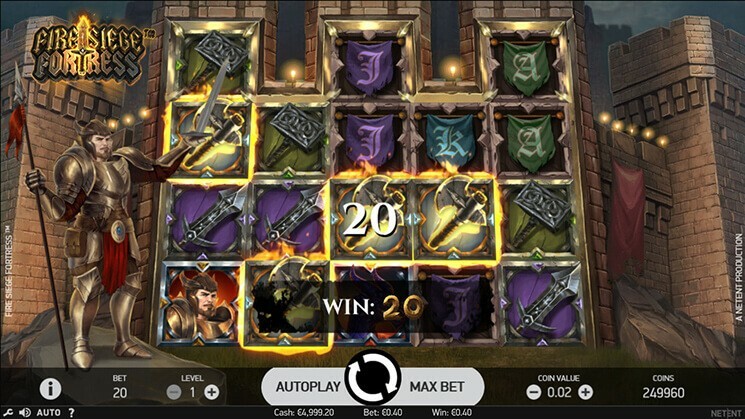 – Trebuchet Assault feature – 4th Reel feature: 1 or 2 Giant Wild symbols will appear, awarding you bigger winnings. Free Spins feature activates when 3 Scatter symbols land anywhere on the 1st, 3rd and 5th reels. If Scatter symbols land on the top position you will get 6 Free Spins per one symbol. If Scatters land anywhere else except top position, you will get 3 Free Spins per symbol. Theoretically, if all the stars align, you can win up to 3,456 times of your stake.